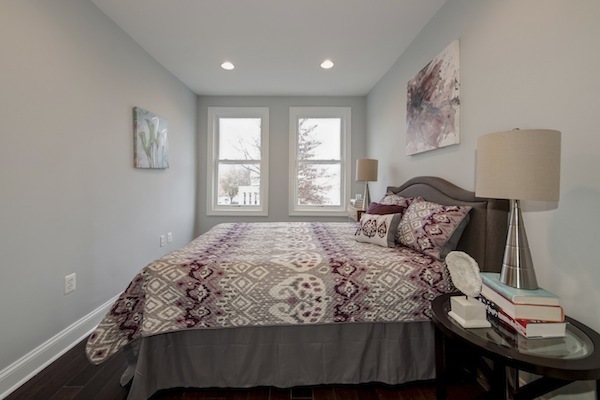 A main house with 3 bedrooms and 2.5 baths, including the best master suite we’ve seen in a long time — closets galore with an organizational system actually installed (never happens). 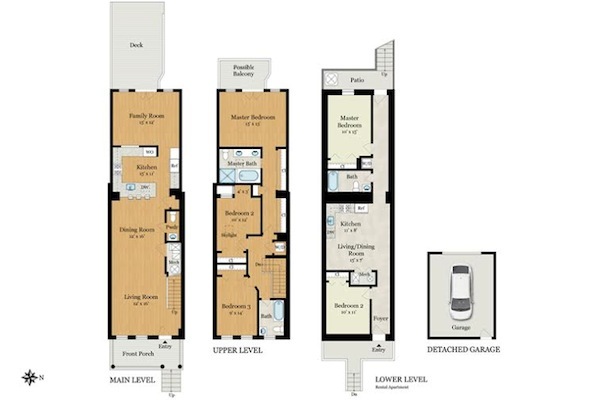 And don’t get us started on the first floor layout — lighted tray ceilings, family room addition off the back, half bath, truly a chef’s kitchen with gas range and two ovens, and a huge yard that leads to an oversized garage. 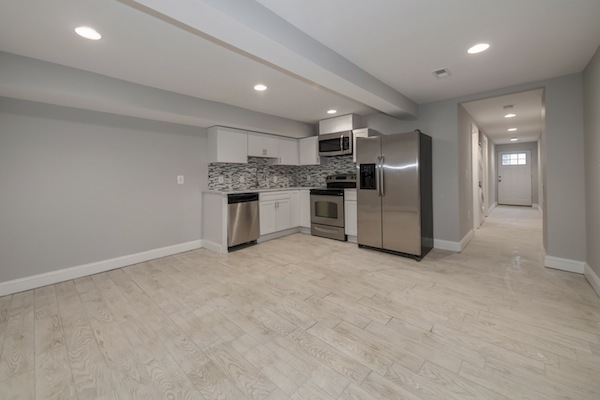 A completely renovated two-bedroom legal rental unit with Certificate of Occupancy (C of O). This gorgeous space shines with its open floor plan – living room, dining room, and kitchen in one swooping view. 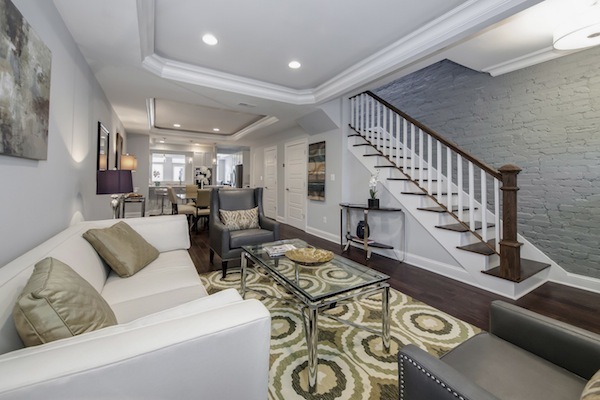 And check out those hardwood floors! 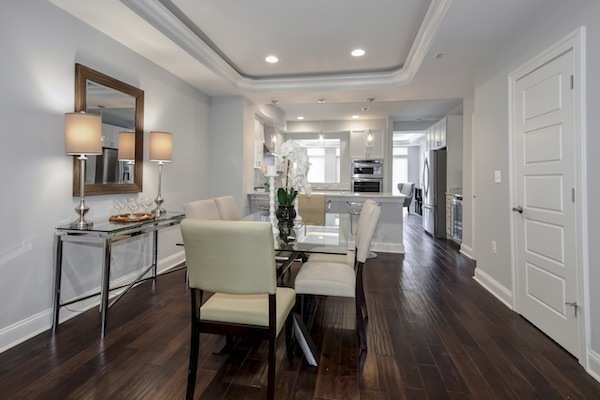 The dining area has enough room for large table gatherings and entertaining plus easy access to the kitchen countertop with barstools. 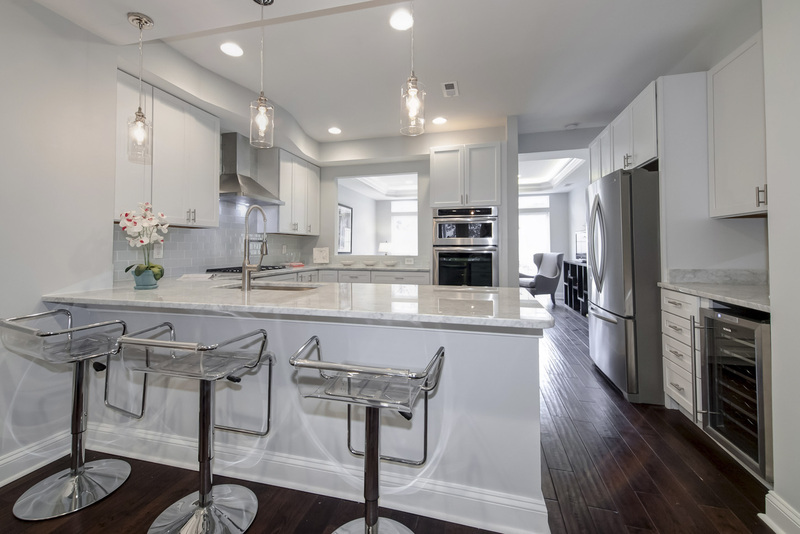 Who wouldn’t want to perch themselves on barstools and watch the chef in action in this beautiful kitchen space? Pass the olives for the martinis, please! 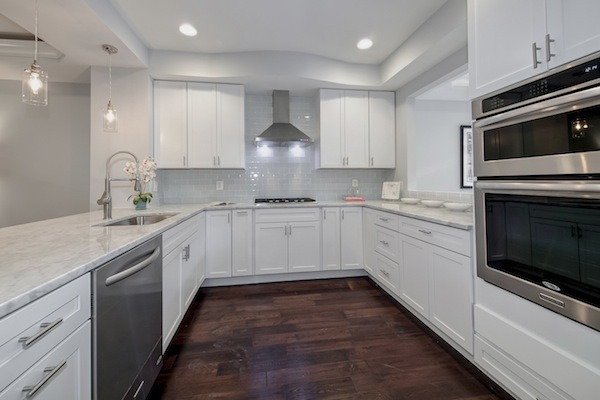 And the design award goes to … this updated kitchen, which features stainless steel appliances, lovely marble countertops, a double oven, recessed lighting, and even a wine refrigerator. There’s room for a comfy sectional and a big-screen TV, and you’re just one step away from grilling on the deck outside – perfect for hosting game days with friends and family. 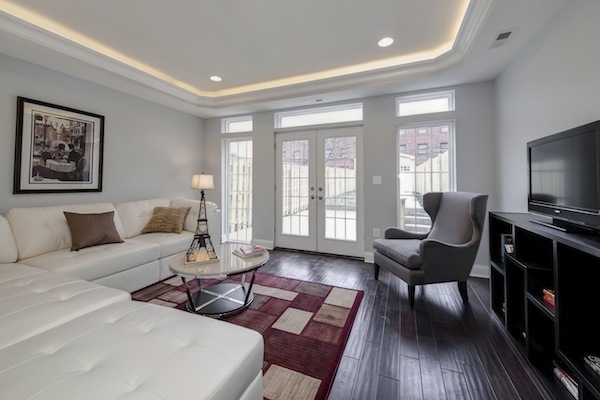 This sunny townhome was enlarged during its recent renovation, creating a great home with plenty of living space on each level. 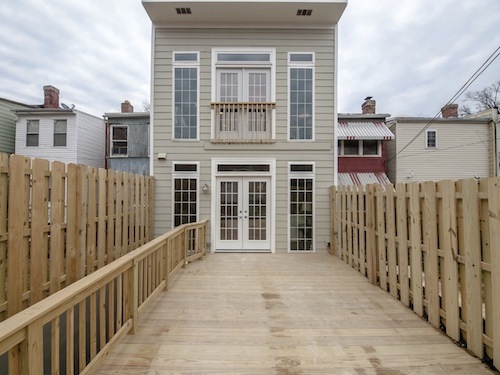 Relax and entertain on its awesome deck and grassy backyard … and you’ve got your very own garage to park your car or store your bikes! This master bedroom suite is a perfect airy retreat with this light-filled space. 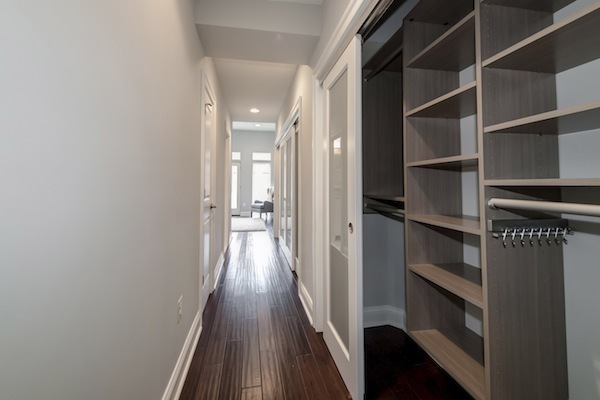 Closets galore! The master suite has two large, customized closets and a private bathroom off the hallway leading to your room. 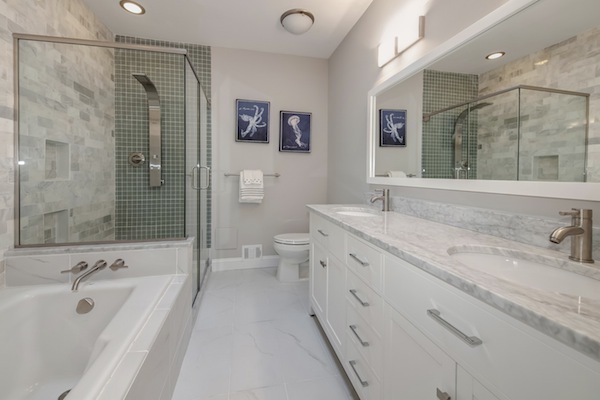 Your daily routines will be hassle-free and relaxing with your own double sinks, a large shower, and a soaking tub in this soothing master bathroom with marble vanity and floors. 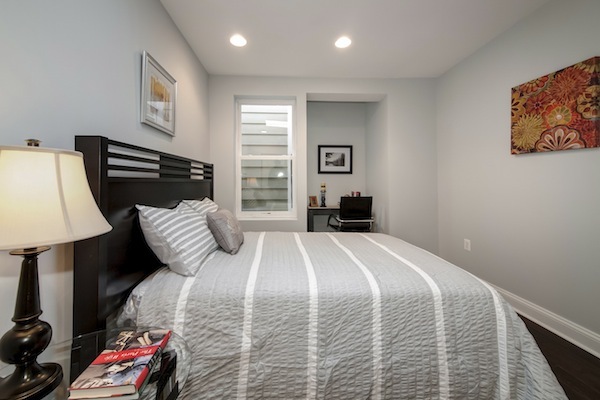 This bright second bedroom features a large closet for wardrobe and storage needs plus ample room for a queen-sized bed. A spacious closet and even a nook with desk give this additional bedroom the special touches your guests deserve. 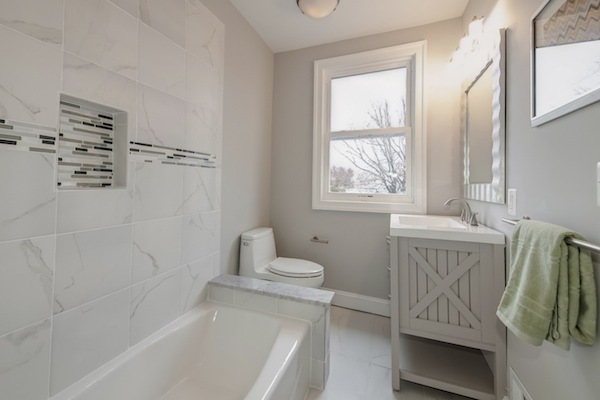 The second full bathroom gleams with a new tub, wood-enclosed vanity, and trendy tile work. 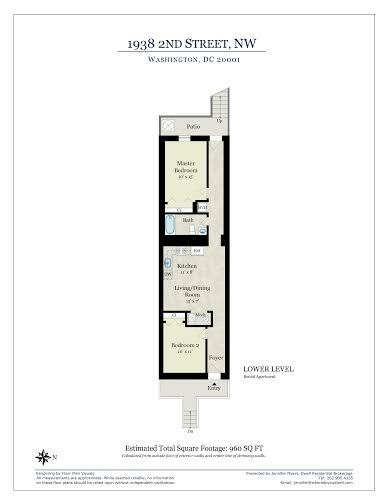 This 2-bedroom basement apartment space is perfect as a rental, au pair space, or even as extended family quarters. 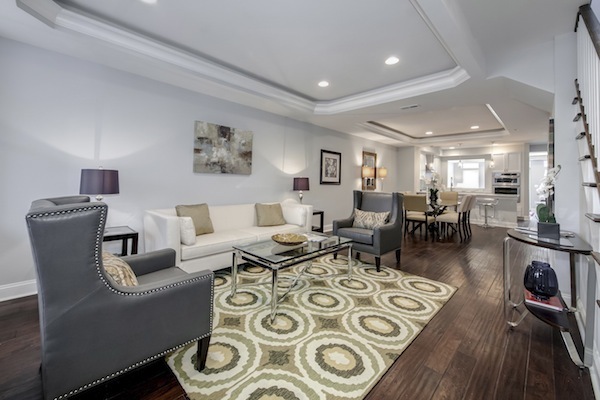 It’s been totally renovated with new kitchen and appliances, separate walk-out entrance, and a washer/dryer in-unit. 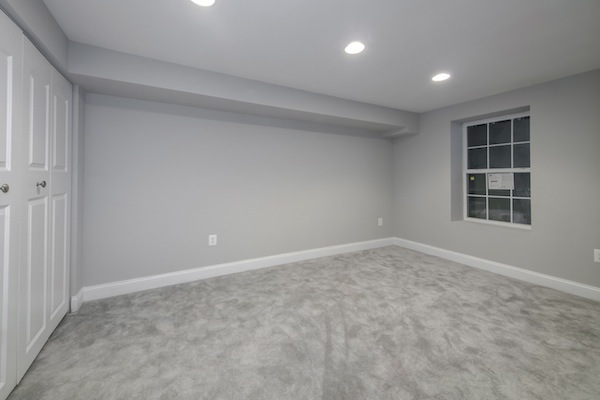 This is one of two generous-sized bedrooms in the basement apartment suite, featuring a large closet, outside light from a window, and cozy carpeting. 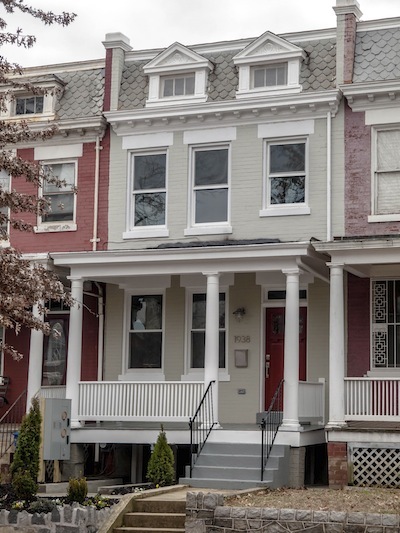 This LeDroit townhome has the DC charm you’re looking for – love that front porch – and the latest updates and size you want for today’s city living.